FILED UNDER: Grand Rapids · Michigan · stealing · Won't somebody think of the children? The library probably participates in the national reading program in which you have to order all supplies from one vendor. That vendor charges an arm and a leg and is often out of supplies by mid summer. But go ahead and Dream Big at Your Library! Someone stole the Summer Reading Program? Put out an APB for the library equivalent of the Grinch! maybe they took the sign home so their friends could read it too. Sharing is caring! i bet you anything this is in east grand rapids, home of the pennypinching rich dutch snobs. If it’s not Dutch, it ain’t much. I was ten years old when I left Grand Rapids, and am now twenty-one and live in Seattle. I am 100% pure Dutch. My dad lives up to the pennypinching stereotype, my mom is a bit of a snob, but it wasn’t until I left Grand Rapids that I discovered that no one who lives in or around that city (except maybe the Meijer family themselves) are rich. Sorry, hon’, but you’re living in the state with the second-worst economy in the country. There are bigger fatcats to pitch your petty jealousy to. Trust me, all the libraries have to penny pinch in this craptastic economy. So stealing a sign is a big deal. I don’t think it’s about penny pinching. If they can afford to make a passive aggressive sign, why wouldn’t they just use the resources to make another summer reading sign? We don’t make the SRP signs. We have to order them from a company along with all the SRP stuff. So this was basically the same as stealing a book. I’m 50% dutch and middle class. Yes, I’m from a family of penny pinchers but we are not snobs. It’s all just a stereotype. The real snobs are the people who call us snobs. And I can tell from what’s in the background that this picture was not taken anywhere near the East Grand Rapids library. The sign is right there – so the claim that it was stolen is obviously false. Exactly. Someone should pin a sign of the summer grammar programme for signmakers onto this sign. Is this outside the library? I can’t tell. Not that it makes sign theft any better, but part of me likes to think this bit of passive-aggressive goodness comes from a private library supporter and not the library staff themselves. 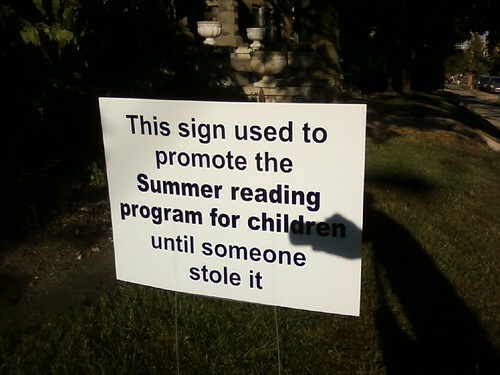 Who on Earth would steal a sign for a summer reading program? Surely it is more likely that it blew away or something? I suppose it’s possible someone needed a large piece of cardboard for an emergency kludge. Or maybe it’s a genuine act of vandalism? To protest the inclusion of some unspeakably subversive piece of literature like Huck Finn, or something? People will steal weird things from the library. Someone comes in almost every day and steals the toilet paper. Others will steal DVDs out of the case and leave the case behind – and not even of good movies but weird stuff like The Telephone with Whoopi Goldberg. And then there’s the weird vandalism we’ve had like some guy who likes to flush his underwear down the toilet. Would you want to be seen purchasing “The Telephone” or “Twilight” for that matter? If your bookstore knows you as a well-read and intelligent person, probably not. And you just can’t risk screwing up your Amazon suggestion algorithm dealie because then it will probably be a long time before it suggests decent books again. Seriously though, odd things go missing. One time I went downstairs to adult fiction, found an auto book on cassette case down there – someone had stolen all 16 tapes and left the empty case behind. Seems to me if you can steal 16 cassette tapes, you could just steal the case too. And likely with the sign a new one can’t just be made since it’s a company that makes them. Libraries sign certain contracts when purchasing. Take DVDs for instance. My system is only allowed to buy them through Baker & Taylor. So if we want to add Dexter Season 5 we have to buy it from them. (I forget the exact price but last time the librarian checked it was somewhere around $200 I believe.) No, we’re not allowed to buy it from Amazon who has it much cheaper. B&T would get very mad at us if we did. If, however, a patron or several patrons wanted to chip in and buy it off Amazon or from a store and donate it to the library, well, that’s another kettle of fish all together. Since B&T sells it, we can add it to our system. So it’s quite possible that if the library makes a new SRP sign to replace the stolen one, they could get in trouble with the company that makes them. Does B&T have spies that come over to check if you’ve turned into a renegade and purchased something at another company? It’s been a while since I’ve borrowed audio-visual stuff from the library, but I think that they kept all the cassette tapes, etc. behind the check-out counter. So if you wanted to borrow something, you’d take the empty case and bring it up to the desk to be checked out. With CDs and DVDs the magnetization thing isn’t an issue. To prevent the kind of thievery you describe, I assume that they’ve put the barcode stickers on the discs themselves rather than the case. Maybe you guys could try that at your library. We’re too small to keep it behind the desk. The large branches with huge collections do that. Haven’t seen “Don’t Bother to Knock”, but I hear it’s good, and one of the few roles where she doesn’t play the ditzy helpless blonde. I really liked “The Misfits”, and I assume I will like “Don’t Bother to Knock” when I see it. I don’t know much about the practicalities of copyright law, but I think that they make libraries pay so much more for videos because movie distributors make a stink about losing money. If x people borrow the thing and subsequently don’t buy it, they claim that as lost revenue. So instead they make libraries pay obscene amounts for their material to “recover” some of these theoretical profits. Book publishers probably don’t have the same legal loophole to charge libraries more for their books, or to stop people from donating their stuff to libraries. Oh yeah, I’m sure you’ll enjoy DBTK. It’s just so creepy. I don’t want to spoil it for you though. Yeah – heck, people who come into the library can be weird. I’ve seen a woman randomly go up to another woman and say “I know what you did to Betty!” Had a guy tell me all about his roommate who he claims keeps her cats in her bedroom and lets them pee all over the carpet. There was one guy who would go up to every overweight female (myself included) and give them materials on a woman’s role in the Mormon Church. One guy claimed he could tell the future from people’s ears and said I was going to be very rich someday. Not that all our patrons are weird like that. Most are nice. But there are those that are just a little nuts, some who are incredibly mean, some we’ve had to call the police on, and some that are so dumb you wonder how they remember to breath. It’s the end of the world, run for your lives, people are stealing $10 signs! Next thing you know people will steal blades of grass. Of all the things you could possibly steal in this world, why steal a worthless sign? Why not rob a bank or something? Just checked with the children’s librarian here. They’re closer to $20. And then the thief comes back and takes this sign as well. The signs will keep getting progressively bigger after each theft. It’s like plucking one gray hair and having two grow in it’s place! The people responsible for sacking the person who was supposed to watch this sign, have been sacked. We will now continue the signs in a different style. I’m a real estate agent in GR, and I get signs stolen all the time, especially during the summers. The economy is bad, so the teenagers don’t have jobs anymore, and they run around doing stupid things.